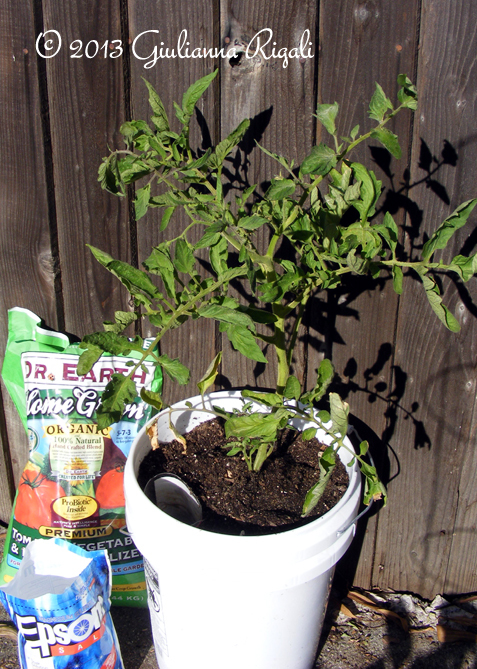 Surprise - The Mystery Tomato Plant! Every spring/summer, I have a mysterious tomato plant come up somewhere in my garden. I never know where it will be or which variety. This year is no different. In the midst of where St. John's Wort was last growing, in extremely sandy soil...popped up a tomato plant. I had to get it replanted, as the sandy soil is stressing out the plant and started causing leaf roll once it got large enough. I make up self-watering containers out of two 5 gallon pails and recycle plastic drinking bottles (or in this situation, an old apple vinegar bottle) for the watering spout. Originally, I started using the self-watering containers under the impression I would not have to water as often, but that joke is on me. I still have to water at least once a day during the summer. Mixing up the soil for the mystery tomato plant. 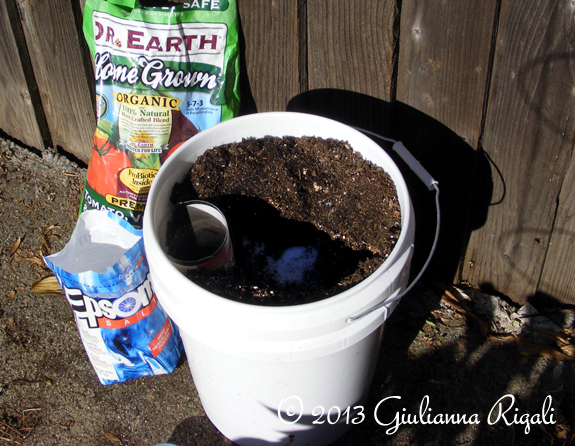 To prepare the soil, I use either a good quality organic potting soil or make up my own. 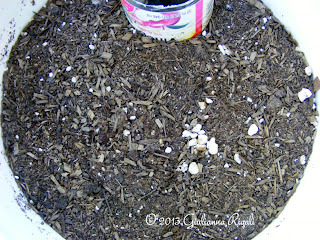 To that I always add 1/2 cup of Dr. Earth (my favorite fertilizer) and an equal amount of Epsom Salt (helps keep blossom end rot away, as it helps the plant uptake the calcium it needs). The last two years my mystery tomato plants have turned out to be San Marzanos, which I have planted in the past. So I am expecting it to be the same this year. However, the closest tomatoes growing to it were the Black Cherry Tomatoes. Outside of the mystery tomato, I usually get a mystery melon/squash plant. Then the hundreds of Violas, Zinnias, Forget me Nots, and Alyssum that come up all over and have almost become "weeds." So tell me something, which mystery plants come up in your garden?